Frontline OOB - Show off your lineups! Which vehicles you have ready to go to Frontline? I currently only have the IS-3 as standard since I already finished my T-44 grind. Maus line isn't as much of a priority as the 277 so... I guess in this one I'll be focusing in grinding credits for the most part. How about yourself? Edited by Rilleta, 10 March 2019 - 05:35 PM. T25 Pilot - Turret bounces Progetto's all day long. SU-130PM - Big gun and mad crew skills. BC-12t - My favourite assassino in the entire game. Centurion - Meh why not. O-HO - Oh hell no! Not for FL. Not even once. Don't know why I mentioned it. I have an odd line up :/ but it works. Lorr 40t, Progetto 46, Skorpion G.
Don't really need anything else, as I consider that the optimal line-up for damagefarming. But for some variety the occasional wz-120ft, Defender or IS-3a. Also I haven't tried my Ebr fl10 yet so I'll give it a go in frontlines. I have others, but these would be the primary picks. Actual selection depends on mood and needs of the match. Thinking about getting the Progetto, though my crew would be poor compared to every other tank I could throw at this mode. Stock T-44 and stock chinese TD. And the TVP VTU to stomp all those Defenders. 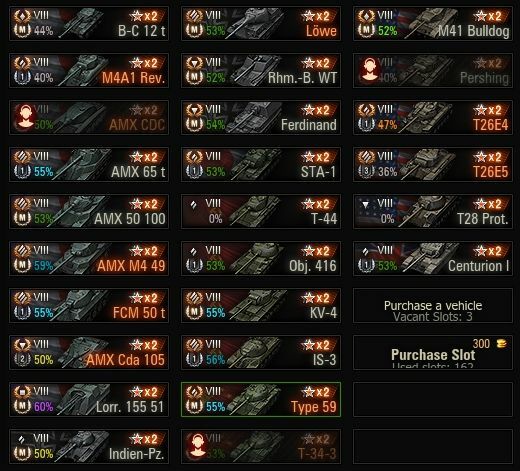 Because tech tree tanks and premiums are so balanced. Which vehicles you have ready to go to Frontline? No TD or arty at the moment. Come on WG, where's that premium tier VIII arty? Honourable mention to the KV-4 and the VK100.01P, which I sometimes use and mainly when city fighting. Grinding all the non-premiums in the list, and I generally start the game off in the IS-3. European Community → English Speaking Community → Forum → Game Discussion → Gameplay → Poll Why do people dislike WVs so much? European Community → English Speaking Community → Forum → Community Area → Videos & Streams → ►Most Ridiculous Game Ever. No Contest.